As people are probably aware by now every Dalek Mod update video pre Update 25 (with the exception of Update 14) has been lost. This is because UDWF1 chose to delete them from his channel without offering them to us first. As you can imagine this news is quite sad as it means over a years worth of the Dalek Mod / SWDTeam history has been lost. SWDTeam will be offering rewards to anyone that can provide us with information to where we can find these videos or to people who have cached / downloaded copies. We hope to eventually find them all and restore this missing part of our history. Does Sam / UDWF1 have them? 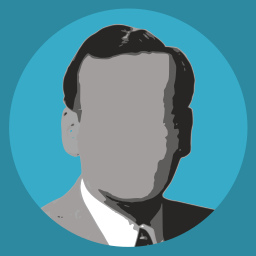 We've been talking with him and he says that he cannot find the videos, nor the files he used to make them. There may still be a chance he'll stumble upon one or two in the future and will be kind enough to send them to us so we can archive them. We would also like you to respect Sam and not go after him demanding videos / information. I'm sure he does not want it. If we do see people from our site who are going after Sam you will receive a temp ban on the website. Where can we see what's been found? Could you use the wayback machine to recover them? This situation sorta reminds me of the Classic Doctor Who situation, where many episodes (97) are still missing. Anyway, I hope you do recover them, as I remember watching alot of them. Might be able to get quite a few, will check on PC this afternoon. Nice to see you have at least a few. I've been beating myself up that I didn't download any. 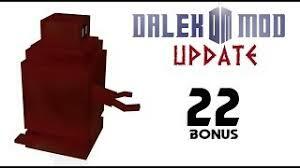 I really hope someone has Update 21, that's the first ever Dalek Mod video I watched. I'm also curious what the situation is like on the 2013 advent calendar videos? We will be adding these to the list shortly! That was the first thing everyone tried, but the way that site works is that it takes snapshots and there weren't any for any of the Dalek Mod videos. Spent the last few hours double checking the way back machine (hey, it beats Mandarin homework). Note: I DID NOT MAKE THIS MOD! Stop asking me to fix stuff as I have no code skills! I take a look at Dalek Mod version 0.5 for Minecraft 1.5.1 Modloader. This update adds new crafting recipes, a pet Dalek and a new and better way to travel to the End. Contains exclusive, never-before-seen, cries of fear from RedDash16! I didn't include any of the links. Than you so much doe! Just added the changes to the page! Found update 4 and the special calendar(also said I did in discord)! Found update 4 info: Well aren't I a lucky birthday boy? In this video, I review the Dalek Mod v0.6.1 for Minecraft 1.5.1. This time we look at underwater Daleks, Weeping Angels, and the best of all... The SNOWMEN! REMEMBER: YOU MUST HAVE THE LATEST DALEK MOD INSTALLED FIRST! THE .EXE VERSION IS FOR WINDOWS THE .JAR VERSION IS FOR MAC/LINUX Dalek Mod Forum thread: http://www.minecraftforum.net/topic/1,544,398-162-forge-modloader-sp-mp-the-dalek-mod-updated-170,913-forge/ Visit http://www.reddash16.com for some cool videos related to this video and other things! You can see me rant at various things and know when i am uploading a video ASAP. This update has a title, and I think you can guess what's in it! I'm really sorry because in the last few weeks I received a lot of pre update25 videos. If there's anything else that I can do please say it! I tried to use Google.fr Google.co.uk and others but this is what I could find after an hour. wait a minute couldint we just use the waybackmachine?? No, I tried, the Wayback machine doesn't do Youtube videos. Oh my god, this is a missing SWD video which was deleted in early 2015. Do you happen to have any more?